As Advancement director for AGWM, Randy Hurst manages all appeals, thanking and reporting for Senders Fund, AG World Relief and special World Missions projects. Born in South Dakota, Randy was 4 years old when his parents, Wesley and June Hurst, went to Tanzania as pioneer missionaries. For six years they worked to establish Assemblies of God churches and organize a national fellowship. Randy attended the Augustana Lutheran boarding school in Kiomboi, Tanzania, some 430 miles from where his parents served in Mbeya. Even as a young boy, Randy had no career plans other than missions. At the age of 7, he felt drawn to the Pacific Islands. To prepare for ministry, he enrolled at Central Bible College in Springfield, Missouri, and graduated with a bachelor’s degree in Bible. While at CBC, he met and married Ruth Bergstrom, daughter of Gustav and Alice Bergstrom, pioneer missionaries to Brazil for 55 years. After graduation, Randy traveled as an evangelist. Later he served as youth pastor at First Assembly in Des Moines, Iowa, and taught classes at Open Bible College. The Hursts then pastored in Fairview Heights, Illinois, before going as missionaries to Samoa in 1977. Although no Samoan language schools existed, Randy became fluent in the language with the help of patient Samoan villagers. The Hursts returned to the United States in 1983. For the next 14 years Randy traveled nationally and internationally as an evangelist. An accomplished photographer and writer, he has authored several books and more than 100 articles on missions, evangelism and discipleship. He was named AGWM communications director in 1997. In addition to a bachelor’s degree from CBC, Randy earned a master’s degree in intercultural communication from Assemblies of God Theological Seminary and has done additional graduate study at Concordia Seminary in St. Louis, Missouri. 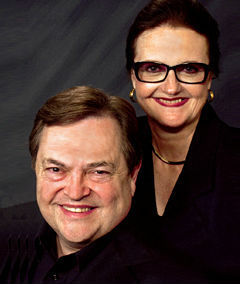 Randy and Ruth have two sons: Rolly and Russ. Rolly and his wife, Heather, are missionaries to Peninsular Asia; Russ and his wife, Cari, pastor in Shrewsbury, Massachusetts.